I've written a great deal about the bottlenecks in the Chinese healthcare system and the problems that stem from having a hospital-based initial consultation system as opposed to European-style general practitioner gatekeepers. While China is slowing moving towards community clinics (most notably in Shanghai) - it will be a while before there is any system that efficiently triages and treats the minor illnesses and also provides continuity for people with chronic disease. In the meantime, Chinese patients are struggling to access doctors hidden away in the fortresses that are State-Owned Enterprise hospitals. They face a lot of hassle to register for an appointment and then long waits to actually see a doctor in a rushed consultation. Nobody is happy with this situation. Enter the Mobile Healthcare providers (Cellphone for the Yanks). The Big Three at the moment are Baidu, Chunyu (Spring Rain) and Tencent-DXY. Let's deal with them one at a time. 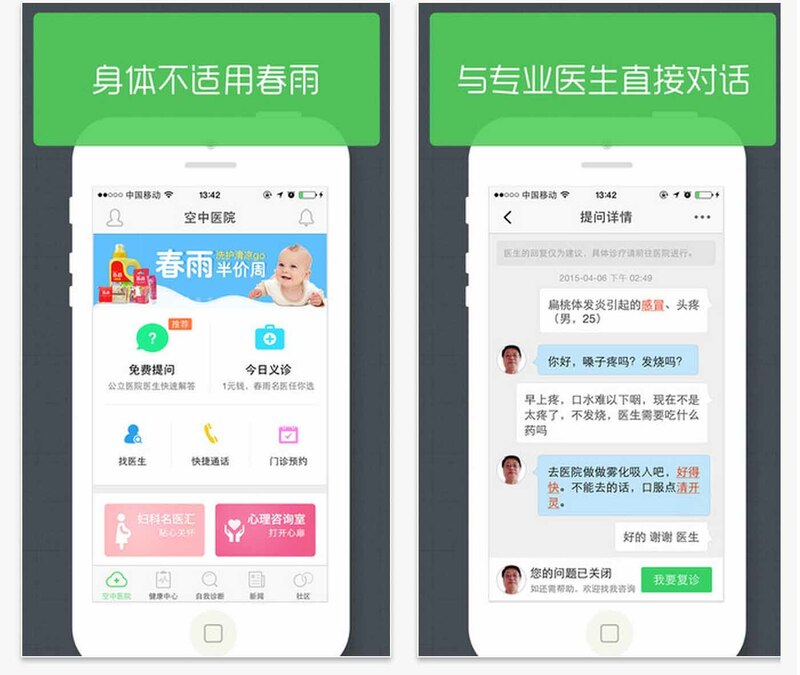 Baidu are making big moves into mobile healthcare. They are China's biggest internet search engine and major internet player, so they have a lot of clout. Baidu are playing to their strength and basically offering an online appointments service, based on their search engine results. 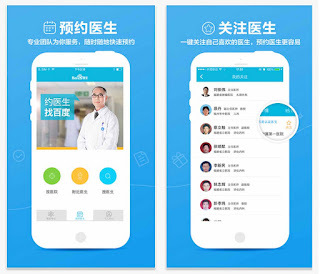 The recently launched Baidu Doctor app allows users to find the nearest available doctors and book an appointment. It also includes some menus that allow the user to work out which kind of doctor they need to see. There is also a rating system that allows users to leave feedback on the quality of their experience. Baidu are rolling this service out nationally, province by province, and have made some strategic partnerships with key hospitals to ensure that they are offering appointments with certified, named doctors. So far they have signed up 1000 doctors nationally - not many in a country that has 3 million - but they are working to ensure that the doctors they enrol are kosher. As a search engine, Baidu have had a bad reputation for advertising dodgy healthcare services, hence the recent falling out with the Putian chain of private clinics - who some have said owe more to marketing than medicine. Baidu are now trying to build up a reputation for quality and reliability - as well as convenience, and they certainly have the resources to invest in building up a network of doctors. However, by offering what is essentially an online referral system they seem to me to be duplicating the role of the general practitioner gatekeeper. How Baidu will sit with the government's policy of building up primary care and discouraging people from heading straight to hospital remains to be seen. 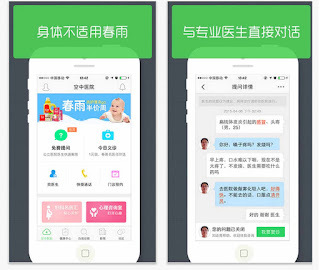 The next big name in mobile health is Chunyu - Spring Rain. They are essentially an online consultation provider - with an app turning the mobile phone into a telehealth device to allow the patient to speak directly to a doctor. www.chunyuyisheng.com claim to have 45,000 doctors online, and say they can hook up a patient with a doctor for a phone consult in just three minutes. The doctor provides advice and medical information in conjunction with Chunyu's online searchable medical library. The service also offers an electronic health record, personalised advice and links to nearby medical providers and pharmacies. This seemed to be a promising avenue until the health ministry outlawed online consultations earlier this year except for patients registered with authorised hospitals. I'm not sure how Chunyu are managing their way round this, but they now say that users must be registered to receive medical consultations. They have also announced that Chunyu will be setting up bricks and mortar clinics in addition to their 'virtual' ones. I personally am not a great believer in online consults. They may be useful as a convenient substitute for a limited number of consultations where the interaction between doctor and patient can be verbal - but most illnesses need a healthcare provider to be there to assess the patient in person. It is often the subtle signs that are only visible in the flesh so to speak that are the most crucial. Not to mention things like continuity of care, need for tests and scans and physical examination. When online doctors can remove earwax, change dressings and do Pap smears I'll get the app. Until then, it's just a glorified advice line. Last but not least in the Mobile Health wave of the future is the partnership between Tencent and the doctors' forum site DXY.com (Ding Xiang Yuan - which translates as Lilac Garden). I have a lot of respect for DXY.com because their forums are docgor-driven and the site for good quality doctor-to-doctor discussions. They also provide Continuing Medical Education (CME) and healthcare news. There's nothing really like DXY in the west. There are the so-called 'Facebook for Doctor' sites such as Sermo and Doc2Doc but they haven't really taken off and become universal in the way DXY has in China. I should point out that DXY is focused on younger doctors, though it does have content sourced from the older 'master clincians'. The success of DXY really reflects the positive attitude towards technology and social media among young Chinese - but sadly I think it also reflects the 'silo' mentality of Chinese healthcare and culture, cut off from the outside world. DXY features a lot of content and discussion around translated medical research from the west - the big journals such as JAMA for example. However, Chinese doctors seem to feel more comfortable discussing medical practice and developments in their native language and behind the Great Wall of DXY rather than venturing out into the wider online world and conversing directly in English. The lack of access to social media sites such as Twitter and Facebook means that most young Chinese clinicians can't take part in the many vibrant medical exchanges now going on in the social media sphere - groups such as Free Open Access medical Education (FOAMed), for example. Anyway, Tencent has recently partnered with DXY, presumably hoping to harness all that young medical know-how and try to extend the online physician-to-physician communication links to physician-to-patient links. At a recent medical tech meeting, Tencent's investment manager Mu Yifei explained their philosophy in mobile health. Rather than being a 'disrupter' he said Tencent recognised that doctors would still be a the centre of any new online health system, and the company aimed to provide a new, smoother pathway between patients and doctors, based on data and information. Ma said that it was early days in mobile healthcare development, but they hoped to harness the skills of doctor online using the tools that have already brought them so much success in areas such as microblogging (Weibo), instant messaging (QQ) and their taxi app Didi (just banned). It's worth remembering that Tencent is a $200 billion company so they're not short of resources to invest in the mobile medical market. Ma said the main areas for reform in medicine are unreliable costs, information silos, inefficiency in getting to see a doctor and the lack of good networks for users of the healthcare system. He gave an example of how mobile networks for restaurants now allow users to find a restaurant, peruse the menu, order online, make a reservation then pay and leave feedback. Can this apply to healthcare too? At present the DXY partnership offers only limited advice online for patients. The founder of DXY, cancer immunologist Dr Li Tiantian, is sceptical of the 'flashy' medical advice apps that are now in fashion. He has said the future lies in two-way communication between patient and doctor, not one-way 'advice' from the physician. His vision is for patients to be given more encouragement to self manage their illness and give feedback to the healthcare provider. In this, he sees the longer term role of DXY in collecting and using information from patients - rather like a market research company - instead of just pushing out information and services to patients. This then, is my brief introduction to the mobile health players in China. It's a fast moving field, and like other areas of internet and social media in China, it is very much a local game, with western companies either excluded or late to the game. Having said that, China seems to be leading the way in mobile health - there is great enthusiasm for mobile solutions and the Chinese are avid early adopters. China also faces less of the red tape and regulatory barriers that exist in the west around matters such as patient privacy, confidentiality of data and the regulations around doctors' scope of practice when offering online consultations. The other big barrier to online health in the west is remuneration - doctors are highly paid and beholden to either medical insurers (the US) or national payers (NHS, Medicare) for their income. With huge pressure on their already mushrooming budgets healthcare payers are loathe to open up new channels in which doctors could claim income and further inflate costs. In China, things are different. Doctors are poorly paid and at the mercy of their State-Owned Enterprise hospital managers. The government is actively working to break these shackles and encouraging doctors to work independently in private practice. If China's doctors can see an income stream from mobile health, they may well jump in and meet the apparent huge demand for their services. The players in mobile health say that China's healthcare market will be worth trillions of yuan in 2020 - and much of that will be online. keto diet calculator Ultra Keto Slim contains three organic ingredients; Green Tea Extracts, Forskolin, and Beta-hydroxybutyrate (BHB). BHB is what kick-starts and maintains ketosis. Note that ketosis is what forms the basis for the popular Ketogenic Diet. However, this doesn’t mean that Ultra keto Slim cannot be used by people that aren’t on the Keto Diet. In fact, one of the major reasons the product was developed is to help people achieve Ketosis even if they’re not on the often restrictive Keto Diet. This is a really decent site post. Not very numerous individuals would really, the way you simply did. I am truly inspired that there is such a great amount of data about this subject have been revealed and you've given a valiant effort, with so much class. On the off chance that needed to know more about green smoke audits, than by all methods come in and check our stuff.